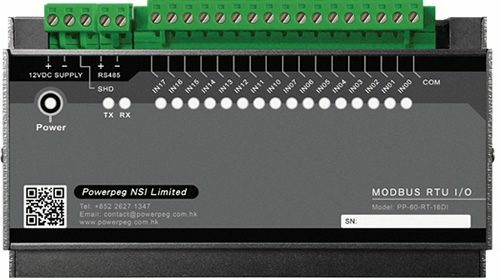 It is a low cost I/O device that supports 16 digital inputs.The large number of digital inputs is perfect for monitoring the status of diuerent devices such as breaker or relay status, alarm signals, air conditioner running status, security door access etc. It can also be used for counting energy pulses and accumulating values in their internal registers. PP-60-RT-16DI supports Modbus RTU communication through its built-in RS485 com port. It transmits data to a Modbus Master such as PLC or SCADA software and is easily integrated into any Modbus networks. PP-60-RT-16DI supports fast response time and allows critical status to be eflciently updated. The Unit ID of PP-60-RT-16DI is software configurable and it supports a maximum of 256 unique IDs. 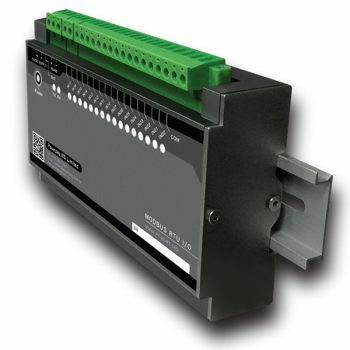 PP-60-RT-16DI is designed with the screw-terminal type connectors that allow the digital inputs to be easily terminated at the unit. Power requirement: +12VDC at max 200mA.